On 14 July Michael was guest speaker at the Air Corps Airmen’s and Airwomen’s 1916 Commemorative Dinner which was held at Casement Aerodrome, Baldonnell, Dublin. With the upcoming centenary of the execution of Roger Casement in mind, Michael spoke to an audience of close to 200 about changing views of Casement since the 50th anniversary of the 1916 Rising in 1966 and Casement’s legacy as a founding father of Irish foreign policy and an international humanitarian. Michael will be returning to Baldonnell on 3 August to take part in a panel discussion during the landmark Ireland 2016 event ‘Casement Day’, which will examine the theme ‘100 years on from Casement: the role of Irish humanitarians in the world today’. 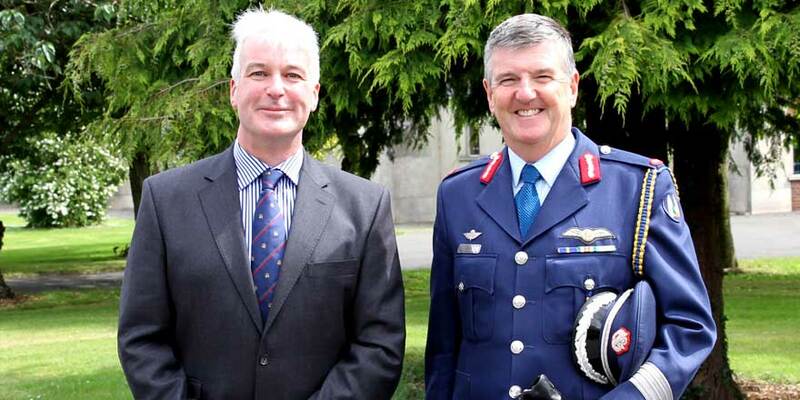 The photograph shows Michael with the General Officer Commanding the Air Corps, Brigadier General Paul Fry.